Dorchester, Mass. – One week after the Tewksbury offense carried the load, the Redmen defense took center stage. Jay Connolly totaled a pair of second half scores, while Tewksbury’s defense permitted just 62 net yards to lead the No. 20 Redmen to a 12-0 road win over No. 24 BC High on Friday night at James Cotter field. Throughout the night, the Redmen (3-0) defense suffocated an Eagles’ attack that tried to generate momentum on the ground. BC High recorded just three first downs and never moved inside the Tewksbury 40-yard line. When BC High (1-2) did try to open it up through the air, the Eagles’ offensive line was often overwhelmed by the Tewksbury front seven. For the night, the Redmen held BC High to just 2-of-8 passing with an interception by Derek Graffeo. Offensively the Redmen alternated between Kelly, Shane Aylward (10 carries, 112 yards), and Kyle Zervas to keep the Eagles off balance in the second half. Both teams struggled to muster any consistent life on offense in the first half, heading into the locker room scoreless and combining for just 140 yards of total offense. Tewksbury finally broke the scoreless tie late in the third quarter through opening up the playbook. On third and four, Aylward received the toss to the right and threw a 30-yard halfback pass to Kelly to set the Redmen up inside the redzone. Four plays later out of a timeout on fourth and five, Connolly found a wide-open Zervas for a 12-yard touchdown on a seam route to give Tewksbury a 6-0 lead. BC High had golden field position moments later with a chance to potentially take the lead. After starting at the Tewksbury 46-yard line, however, the Eagles managed one total yard before being forced to punt. Tewksbury put the game out of reach on its next possession. Over the course of six minutes, the Redmen ran eight plays for 88 yards, highlighted by a 17-yard run from Aylward, before Connolly capped it off with a one-yard keeper to increase Tewksbury’s lead to 12-0. 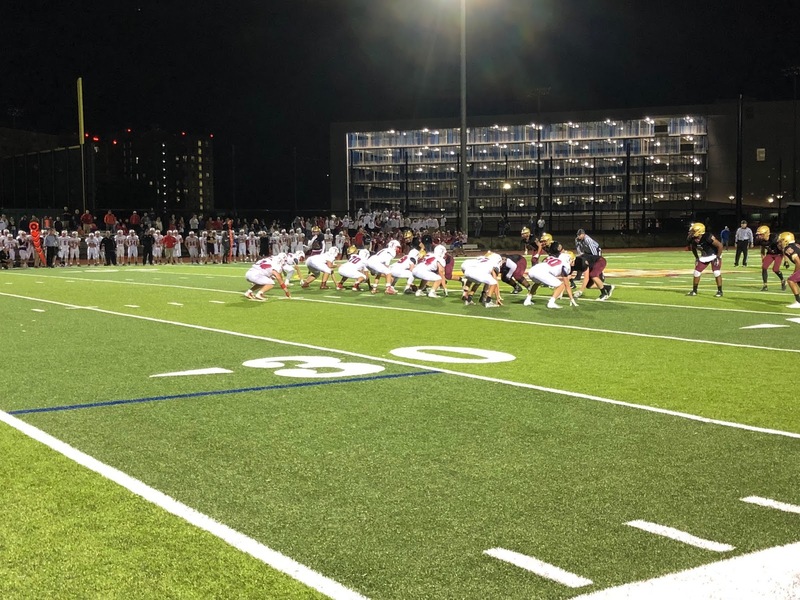 In the first half, the best chance for either team came late in the second quarter when the Redmen went on a 10-play drive, with Aylward carrying the load, that landed them inside the BC High 20. On third down from the 18, however, Eagles’ defensive tackle Keith Henderson came up with the play of the night for BC High. Henderson forced a fumble that was recovered by Brendan King that, keeping the game scoreless going into the locker room.